It is difficult to find out the earliest British public lights but to begin with and like many other Christmas customs it appears that the US got into to it first. The most famous in the UK is perhaps Oxford Street. However, it did not start in Oxford Street. 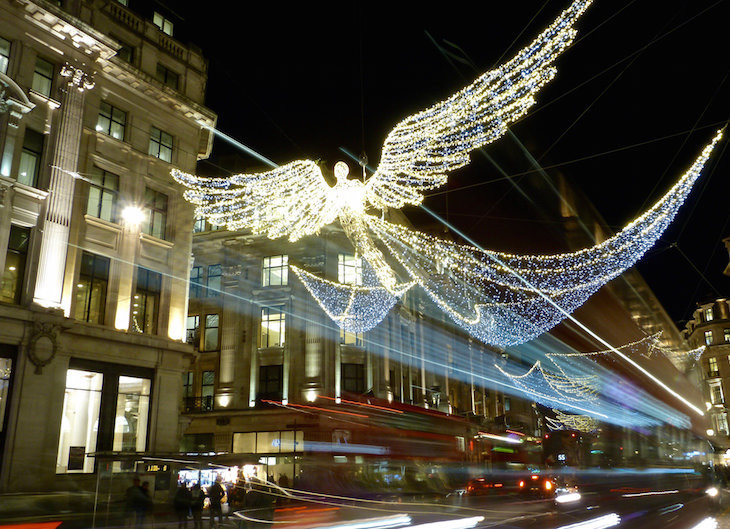 Despite being synonymous with Christmas lights it was Regent’s street which had the first one in 1954. In particular one of the most amazing being gas filled balloons in 1957 It was not until 1959 that Oxford street got in on the act! Over the years the lights have varied and sometimes not been on. Indeed in 1976 and 1977 due to the combination of the Winter of discontent and the stressing of the need to be concerned about wasting fuel, there were not any lights. However by 1978 they came back being fanfared by a laser display to mixed feelings. Cheaper it might have been but Christmassy not! Since then corporate sponsorship has been involved with various big name firms, often London centric, such as a French themed one in 1992 to celebrate Les Miserables. Sometimes the lights can be a little underwhelming especially when they are mainly just white! “It’s early October and in London the countdown to Christmas is apparently underway as the festive lights have already been strung up over Oxford Street. The enormous baubles that adorn Europe’s busiest shopping street were seen being set up on October 2, a full 84 days before The Big Day itself, prompting mild incredulity among Londoners. It wasn’t popular with many coming to Twitter amongst other formats to complain one wryly noting. “Did they have any Halloween lights? The lights have moved with the time, now they use 750,000 LED bulbs which use 75% less energy than conventional bulbs. Part of the custom is to have the lights ceremonially switched on usually by some celebrity. If ever there was a list which grasps the zeitgeist it’s the list of celebrities which turned on the lights. How many could you remember? Certainly the 1981 Pilin Leon is not a name you’ll know…she was Miss World that year…quite you can see what I mean! Since then with had sports men, such as Daley Thompson and Linford Christie, pop stars ranging from The Spice Girls to Cliff Richard, actors such as Lenny Henry and Emma Watson. But occasionally ordinary people get a chance in 1991 it was Westminster Children’s hospital and Children from kid’s company….the stage must have been large for the cast of Coronation street in 1995. The crowds are enormous for the switch on, even more so when it’s a big star, not sure how Derek Jameson might have faired against Westlife. Love them or loathe them to many Londoner’s the switching on of the Oxford lights whenever they are is the sign for the countdown to the biggest custom of them all!